Baby Born From 20-Year-Old Embryo : The Two-Way In 1990 a mother underwent IVF and then donated her unused embryos. This spring, one of those embryos led to a healthy baby boy. What to do with the estimated 1 million leftover embryos in the US is troubling ethicists. 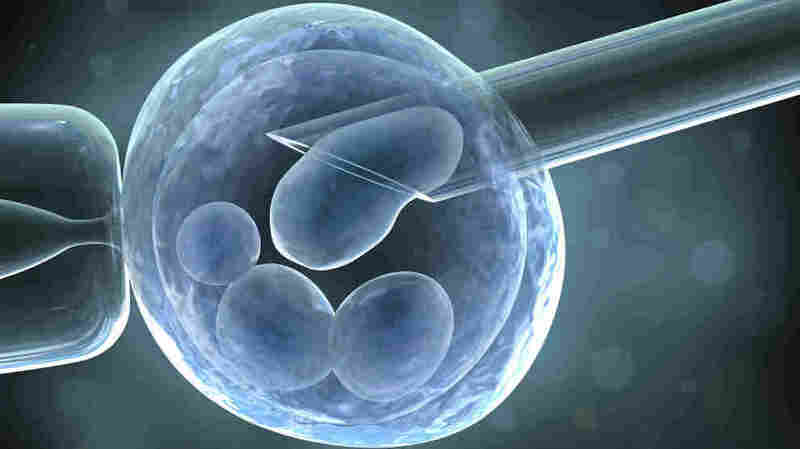 In 1990 a couple underwent In Vitro Fertilization. They eventually had a healthy baby. They also, as is common, had a number of microscopic embryos that hadn't been implanted, but were viable. They decided to anonymously donate them. Now, one of those embryos has produced a little boy, 20 years after being created. This May, a 42-year-old woman gave birth to that boy, as reported in the journal Fertility and Sterility. Frozen embryos are something of a new frontier in medicine and ethics. Last week Robert Edwards won the Nobel prize for developing IVF. But the questions surrounding the leftover embryos is still being struggle with. Recently NPR's Robert Siegel talked to Jeff Kahn, director of the Center for Bioethics at the University of Minnesota Medical School, about just this issue. SIEGEL: There is another area of concern, which is the notion that embryos that are not implanted are frozen and whatever we do with them, are we doing that with human life? Is disposing of them disposing of human life? That problem persists. Dr. KAHN: Absolutely. And I think it's something that was foreseen in some respect. But the numbers at which we create and now store the excess embryos has really gotten to the point where we need a societal conversation and maybe a policy decision about what to do with those leftover embryos. The estimates are something like a million frozen embryos left in the United States alone. And we don't really have good plans for what ought to be done with them. And as the Telegraph points out, that's only one of the issues raised by the new genetic technologies. In 2007 a mother froze some of her own eggs so they could be used by her then-seven-year-old daughter who was likely to be infertile because of a medical condition. If the girl used the eggs she would effectively give birth to her own half brother or sister. Last year a baby girl was born conceived using sperm that had been frozen 22 years earlier.